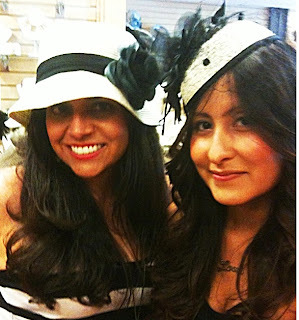 A few friends and I dropped by the Black Cat Hats & Bags Boutique for a Kentucky Derby viewing party last weekend. I won't lie. I didn't attend to watch the horses race, I needed an excuse to wear a fabulous head piece! Don't be afraid to try the over-the-top head couture look this summer. Use a head accessory as the statement piece for your outfit. Try a southern belle look, pairing a flower embellished, big brim floppy hat, with a simple sundress. For a more night time, haute-couture look, pull out a bold colored mini dress, using a head band with a large feather, ribbon and or netted accent for some flair.